Paul Sedler of North Dakota sent us these before and after pictures of his 82 Custom Deluxe K10. 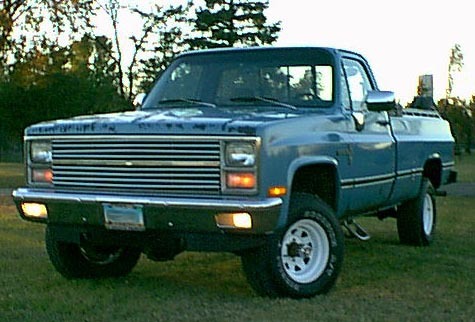 Paul's truck was bought new by his grandfather, then passed to his father, and now he's got it. The K10's original 305 has been replaced by a 350 crate motor topped by an Edelbrock intake and Holley carburetor. It exhales though a 2.5 inch exhaust and speaks with turbo mufflers. Suspension modifications include a two inch lift and the addition of 31 x 10.5 Pirelli Scorpions. Body modifications include moving the blinkers from the bumper to under the headlights, and adding "factory" running lights. Future plans for the K10 include a new set of gauges with a factory tach courtesy of a 78 C10, fixing the cancer, and getting it painted. Thanks for the picture Paul. transmission. Performance modifications include a Hyper Tech chip, K&N air filter, Flowmaster 2 chamber muffler, and 3" exhaust pipe. Joey shaved the emblems and filled the stake pocket holes, added a Lund rear roll pan, chrome grill, blackout light covers, and laid down the cool paint job. Behind the tinted windows you'll find a Pioneer CD player and Grant GT steering wheel. The C10 rides on 15x10 Eagle aluminum wheels shod with 295 50 R 15 tires. Thanks for the picture Joey. Update 10/20/01- Joey has recently dropped his truck 2" all the way around, and added 20x8 Eagle wheels wrapped in 275 40 r20 Goodyear tires. Thanks for the update Joey. Jarred sent us this picture of his 79 Custom Deluxe 1/2 ton. This sweet 79 has a host of new parts including new fenders, hood, doors, mirrors, front bumper, transmission, and weather-stripping. The interior has been refinished with the exception of the bench seat, and has updates such as a Sony CD player and tinted windows. Outside the body wears new paint, diamond tread bed rails, tool box, and chrome tube headache rack. Suspension upgrades include swapping out the 1/2 ton springs for 3/4 ton springs and a set of 275/60R/15 General tires. Under the hood rests a 305 with Flowtech headers, turbo mufflers, and a K&N air filter. It rides on General 275/60/R15's. Jared's next project is installing a new 305. Good luck with your project! Jim Parsons of Nova Scotia Canada sent us this picture of his1978 shortbed. 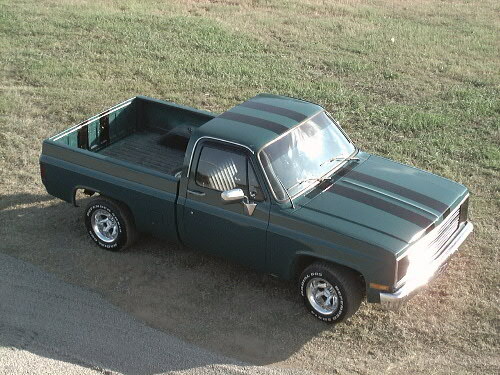 This C10 is one of five Chevy pickups that Jim has owned over the years. Jim's current truck has 82,000 miles and is powered by a 350/350 combination. The stock 350 utilizes parts from Comp Cams and Accell. Future plans include ported heads, matched carburetor and intake, and a set of headers. Backing the engine is a Turbo 350 transmission that has been beefed up with a B&M torque converter and shift kit. 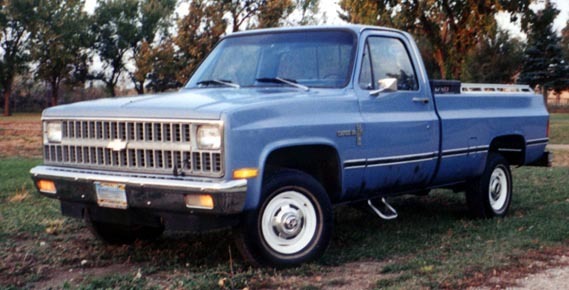 The body of this Canadian cruiser is 95% rust-free and has the original cab corners and rocker panels! All of that pristine metal has been preserved under 1995 Dodge Viper red. The suspension is currently stock, but plans call for replacing the factory bushings with polyurethane bushings and dropping it a few inches closer to the ground. The interior has been kept simple by updating it with 1984 Suburban seats and console. Keep us posted on the progress Jim. Update: The Second picture shows Jim's truck's current state. New mods include a fully painted frame that received all new bushings, headers, braided stainless lines, 3.08 Posi unit, dearched rear springs, and a cut coil up front. Looks good Jim! Most before and after pictures look just the opposite. The basketcase is first and the beauty is second. However, not every fairy tale has a happy ending. Such was the case for Shaun Croissette of Hereford, PA. 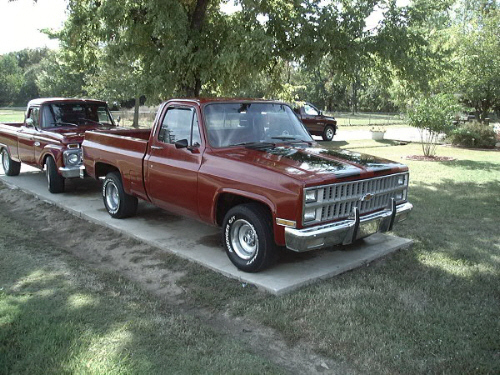 These are pictures of Shaun's former 1979 K10 stepside. The K10 was powered by a 350 crate motor topped with an Edelbrock total power package. The suspension was lifted six inches to make room for the 33 inch tires mounted to a 14 bolt 3.73 rear axle and a 10 bolt front axle. Unfortunately, Shaun's truck was involved in a collision with a drunk driver and lost. But, never fear, Shaun was fine and very resourceful! 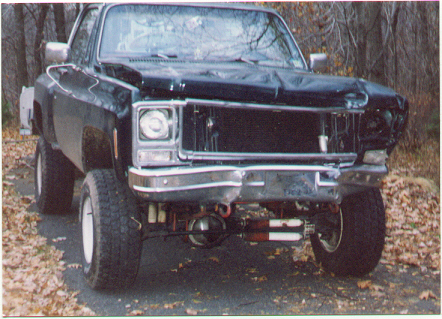 The 79 K10 donated its engine, transmission, transfer case, and cab to his 76 K10 and is still on the road. Thanks for the pictures Shaun. We all mourn your loss!